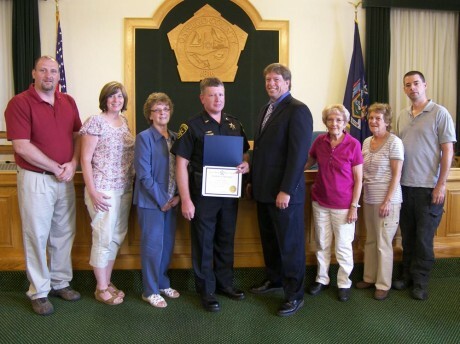 The Oswego County Legislature’s Public Safety and Emergency Services Committee recognized James Dillon for his service to the county. Dillon is a lieutenant with the Oswego County Sheriff’s Office. Pictured from left are legislators Kevin Gardner, District 13; Amy Tresidder, District 16; Committee Chairwoman Linda Lockwood, District 11; Dillon; Oswego County Undersheriff Eugene Sullivan III; Committee Vice Chairwoman Margaret Kastler, District 1; Mary Flett, District 17; and Shawn Doyle, District 3.